When my husband frames a good suggestion in a directive statement such as "Eat that yummy casserole in the fridge," I jokingly respond, "Don't tell me what to do." It's my way of holding on to my inner-teenager, I guess. He knows my response is in good fun. But almost every day, on the other end of the email, strangers get me saying the same thing in earnest. When men and women write subject lines that say, "Tell your senator..." or "Force them to..." or "Stop the..." I delete each one with a defiant click. I join a variety of email lists to see what environmental issues are being worked on today. Whether it be a coalition to protect our national parks or an advocacy group for the respect of climate scientists, most of them send regular emails as promised, to keep interested parties informed. And most of them, it seems, have limited their campaigns to that of the activist's tone. Their announcements all lead with - as the marketing advice says - a direct call-to-action in the subject line, one that's designed to motivate me. But I'm not part of the group of people who need to be moved and directed. And I act because I care, not because a communications manager told me I should. I already know that my elected official needs to hear from me in order to understand how I want him or her to vote. I agree that the next march against fracking won't be worth its existence if nobody shows up. And I realize a nonprofit cannot be effective without my support. The sad part is any email I deleted may have deserved my attention. It probably said which bill the senate was soon voting on or what territory the oil spill has seeped into. I would have appreciated the news and taken down the information about the steps required to make a difference. But since it came at me shouting, telling me how to act before it explained why I should, I reacted to its clear attempt at manipulating my kindhearted nature. Activists are needed because they vigorously get people in motion. But they lose many opportunities to rally support when they begin telling well-informed, mild-mannered, unaffectedly realistic people what to do. It all comes down to understanding and writing for your audience. We cannot forget that sometimes the best way to reach people is to stop instructing and start informing. When the nature lover John Muir worked together with hunting enthusiast Theodore Roosevelt, great things happened. For example, President Roosevelt expanded the protection of Yosemite National Park after spending time there with Muir. Muir inspired Roosevelt to act on his personal convictions and to use his elected power for the benefit of future generations. Roosevelt delivered to Muir the permanent protection of (at least a portion of) a wilderness to which Muir was profoundly devoted. It's a darn shame environmentalists and hunters don't get together more often. 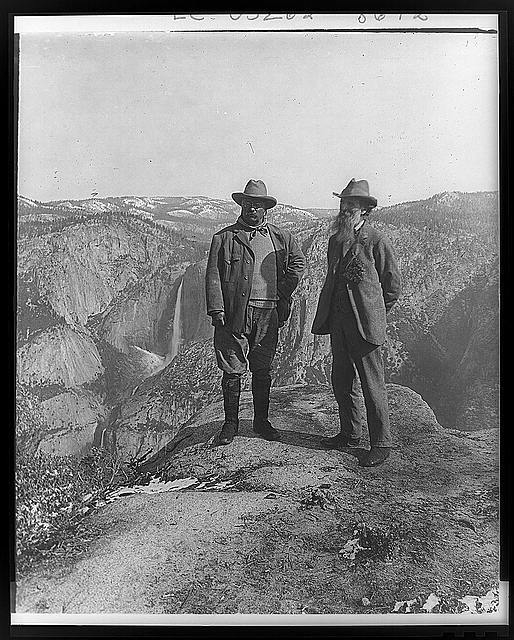 Theodore Roosevelt and John Muir on Glacier Point, Yosemite Valley, California, c.1906, via The Evolution of the Conservation Movement/Library of Congress's Prints and Photographs Division. Sadly, the two groups are usually at odds. Their reasons are complicated and many. At the heart lies differences of passionate opinion about Nature. But like Muir and Roosevelt, as far as I can tell, both the environmentalist and the hunter want the same thing. They both want Nature to be protected from the wants of industry and over consumption. Both want the right to live in a way that fits Nature's design. Both spend time sitting quietly outdoors, and so both are aware of what goes on there. These are the people who best understand the need to reserve some of Nature's spaces so that life on earth can continue. ...I must distinguish myself from the species on which the hunter preys. Meanwhile, the hunter must follow the regulations set forth to keep humans safe and animals abundant. These are compromises we must make. This land shall be shared. And I can think of no one better to share it with than a person who is connected to the source of his or her sustenance and appreciates the ecology of the mammalian existence. We both understand the connection between clean water and diversified habitat, between diversified habitat and abundance, and between abundance and well-being. Why then should we not be friends? "During his presidency, Theodore Roosevelt signed into existence 5 national parks, 18 national monuments, 55 national bird sanctuaries and wildlife refuges, and 150 national forests," according to the Sierra Club, of which Muir was a founding member. Muir spent his adult life confronting the differences of opinions between men, both foes and adversaries. “This forest battle," he wrote, "is part of the eternal conflict between right and wrong. . . . sooner it is stirred up and debated before the people the better, for thus the light will be let into it. "* Discussion is what transformed Muir's love of a thing into Roosevelt's protection of it. Together they achieved more than they either could have done alone. May we continue the conversation they started long, long ago. It's natural to want the many qualities of a good life. But quite often one desire is in direct conflict with another, and that can make the intended happiness elusive. Below is a short list of such contradictions. Pause briefly on each word to best understand how the next is opposite. We find ourselves at odds with ourselves and thus at odds with those around us. There is no cure; it is part of the human condition. We all require flexibility, compassion, and understanding in order to find the contentment that exists in the in-betweens, in the diversity of life. Offer this to yourself, and you will have offered it to the world. What contradictions do you struggle with today? How many times have you been told to reach beyond your comfort zone? It's popular advice that I hear often. It echos in my mind whenever I am challenged to try something new. I know opportunity awaits in the shadows of the unknown, and a journey there rarely turns out to be as scary or difficult as it seemed when I first started out. But despite all this, I cannot forget the occasions when success requires a different approach. Sometimes it's better to simply stay where I am -- to remain in the zone -- until I achieved that pleasurable comfort. Years ago I posted a series called, "What I've Learned From Playing the Piano." Like the posts then, an example of a life lesson revealed itself while I was practicing. I was learning (or rather relearning) a challenging, big-band inspired song from 1941 called the Chattanooga Choo Choo. I'd been able to play it before, but "play it" was more of a "get through it" experience than an enjoyable one. The song steamrolls along, like a train. Even at a moderate pace, spitting out the lyrics ("is that the Chattanooga Choo Choo?") can be as tough as hitting the right chords. Determined to play it properly, while no one else was in the house, I practiced the tricky passages over and over again. "I'm going to repeat this until accuracy is comfortable," I said out loud in frustration after I kept hitting the same old wrong notes. I was training my brain through repetition, and I was doing it because the previous method of scrambling to find the next note wasn't working any more. I remained on some measures for twenty or more passes. Since I hate repetition, that was not a pleasant experience for me. But it was needed if I wanted to get it right. I had to think like the virtuoso who repeats and repeats and repeats until the entire piece can be played in his or her sleep. It doesn't matter if the goal is to play a masterpiece or an old pop song like the Choo Choo. The process is the same: get so good at or so accustomed to doing something you don't second-guess yourself. Thus, success requires comfort. So yes, kudos to the quest for uncomfortable-yet-fulfilling experiences, but don't believe that should be your only endeavor. Like many catch phrases, we tend to dwell on things, as if life were a one-sided coin. Like me, only you know when it's necessary to pause and pay attention, when it's time to stop pushing yourself to catch the next train. Give yourself permission to listen to YOU first, before you act on another's advice. The result could be music to the ears. 1.) Music festivals and summertime vacations. 2.) Preparation to launch a new, online writing project. Though it may feel like it, I haven't been neglecting you. In fact, you've been on my mind quite a lot. With thoughts of you, I have created a reader survey. It is intended to solicit your feedback, which will be useful to me as I develop my next project. Did you know that I've been writing this blog for more than six years? At the end of the survey, you'll find out how to receive a free copy of my eBook, Looking Back. It's a compilation of the most popular posts from the last six years. But don't wait; the survey closes on September 24, 2014.